On the first year anniversary of Occupy Wall St (OWS) several academics signed a letter in support of the movement that included the following statement: ‘We have earned academic and cultural capital from espousing radical positions. Now is the time to lend our support in visible ways to the commitment shown by the Occupy movement and to help it grow and evolve’. Much like an OWS echo chamber, these two statements, written 5 years apart, reverberate towards each other and towards us as we attempt to practice the above call to direct action. 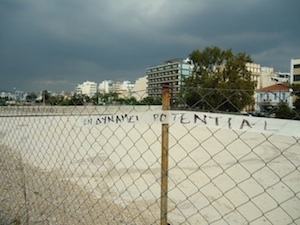 Adhering to the above self-reflexivity we want to effect change within our own present struggles within Athens. The practices we have so far engaged in within Athens and still envision have and will take many different forms. As our dialogue on occupancy, civic zones, disobedience, radical critique and methods develops, we have initiated a present call to action, seeking collaborative methods and strategies. Informed by Butler’s statement ‘ If we are on the move, then we are, in collective forms, tracking the sites of injustice and in-equality, and our trail becomes the new map of radical change’ (Butler, 2012) we open up attempts at radical mapping and mapping radicality in order to reveal what Tim Ingold calls a ‘wayfinding’ , sending a questionnaire to artists, activists, scholars and everyday insurgents around the world that asks them to locate, recuperate, coordinate and map trajectories of disparate spaces and practices of radical change experienced in the past, present and imagined for the future. As the dialogue between the two of us has created the potential for a dialogue with a multiplicity of differing voices and possibilities for ongoing collaborations we feel as Brain Holmes does when he states that ‘the urgency is to express the paths of new cartographies which transversally link artists and social movements , civil society initiatives, knowledge production centers and media technologies, always across the major center- periphery divides’ (2008: 153). Therefore, during the two days of the Performance Matters we will present the developments of this militant mapping in multiple forms, contexts and media and hope to discuss with participants and visitors and others on an online forum, the possibilities for their implementation as manuals in practical matters as they are performed in civic zones and spaces. We anticipate an emergence of theories from collective practices as knowing, methods and ways of understanding the world through walking, getting lost and mapping, asking together. Holmes, B. (2008) Unleashing the Collective Phantoms: Essays in Reverse Imagineering. New York: Autonomedia.